If you are someone that owns a lot of jewelry, you are likely going to be wondering at some point how often you should be cleaning it. Below, we will be discussing some of the different things to keep in mind when you are trying to figure out how often it should be cleaned. Truth be told, you should be cleaning your jewelry often. This is particularly true if you are talking about more expensive jewelry. You want to keep your jewelry as clean as possible because it is going to allow you to enhance its appearance for more extended periods of time. Not only will this keep your jewelry looking better, but it can help to minimize the entire cleaning process over time. It can also help to reduce the number of germs and bacteria that you end up getting on your jewelry as well. This is generally something that you are going to want to do a minimum of once per week. That way, you will be able to keep everything as clean as possible. The best way, of course, to ensure a consistently clean and long-lasting piece is to take it to your jeweler. Using special tools, they can safely and effectively clean your unique piece. 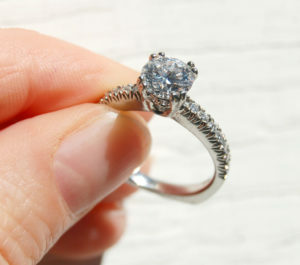 This service is generally included when you purchase your diamond ring or another piece of jewelry. Since this is free and easy, you should take advantage of this! If for some reason you don’t have access to your jeweler, or perhaps want to save time and travel, then keep reading for some easy home tips. If you are going to be doing regular cleanings, you are going to want to use lukewarm water and some mild dish soap in order to soak your jewelry effectively. This will allow you to loosen the grime, dirt, and bacteria on it. 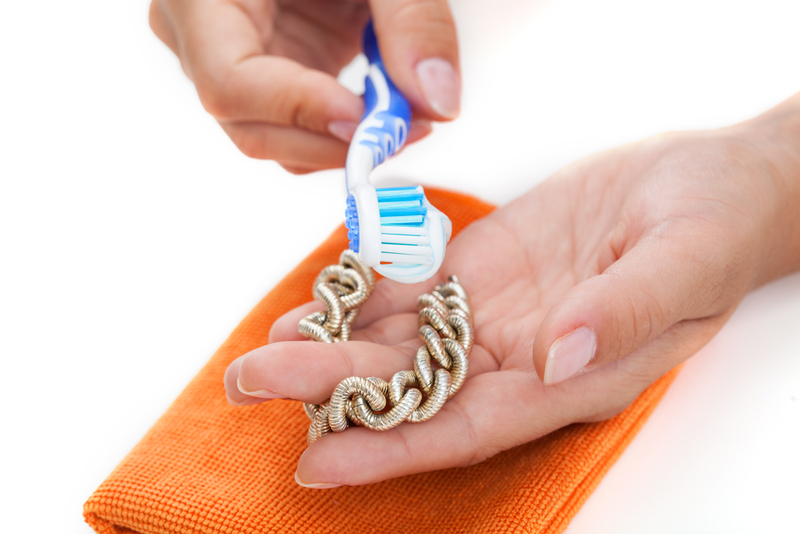 Once you do this, you can simply take a toothbrush and scrub all of the various parts of the jewelry which can help you get rid of junk that might have been caught in between. If you are dealing with jewelry that you only really wear once in a while, you are likely not going to want to give it regular cleanings as you would for jewelry that you often wear. This is primarily because it is not something that is going to require that type of cleaning, to begin with. For this type of jewelry, you are going to want to stick to a yearly cleaning schedule. That way, you will be able to keep it looking great for an extended period. Believe it or not, but one of the best and easiest ways to clean your jewelry would be to dunk it in Alka-Seltzer. By doing this and allowing it to sit in the glass, you will be able to maximize the shine that you can generate on your jewelry even if it has dulled. This is a great way to really spruce up jewelry that might not be looking its best. Another great way to get your jewelry clean is by using a baking soda paste to polish it. You want to do this to remove built-up tarnish that might be dulling your jewelry. You should be able to use the baking soda paste that you make to restore it back to its natural shine. Overall, there are a lot of different things that you are going to want to keep in mind when you are looking to figure out how often you should be cleaning your jewelry. By following the tips above, you should be able to get everything as clean as possible and restore your jewelry back to its best possible state. If you are talking about jewelry that you do not usually wear for significant amounts of time, you are not going to need to clean it as regularly. However, if you are dealing with jewelry that you wear consistently, you want to have a regular weekly cleaning schedule. Northwest Diamonds & Jewelry offers high-quality rings, necklaces and other beautiful pieces for a great price, as well as providing our customers with ways to make them last forever! Take a look at what we have to offer by visiting our main page and also looking our Jewelers in Portland Or Google+ page. What Affects The Value Of Diamonds and Precious Metals? Do You Know What GIA Certified Diamonds Are?